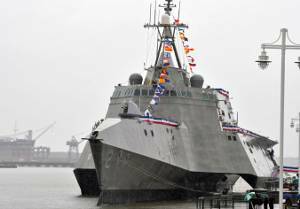 The Navy's newest littoral combat ship, USS Independence (LCS 2), sailed away from Mobile, Ala. for the first time March 26. The milestone marks the commencement of initial testing and evaluation of the aluminum vessel. "We are excited to set sail, and remain grateful for the incredible support offered by the city of Mobile in helping us reach this milestone," said Cmdr. Curt Renshaw, Independence Blue Crew commanding officer. "This transit will allow us to gain valuable operational experience and is another large step toward bringing our unique and versatile capabilities to the fleet." Independence's maiden voyage will include stops in Key West and Mayport, Fla., before pulling into Naval Station Norfolk, Va. for additional testing and specialized crew training. The littoral combat ship (LCS) is a fast, agile, mission-focused ship that demonstrates the latest in naval technology. The ship is specifically designed to defeat "anti-access" threats in shallow, coastal water regions, including surface craft, diesel submarines and mines. LCS features an interchangeable modular design that allows the ship to be reconfigured to meet mission requirements. Independence, the Navy's second LCS ship and the first Independence Class LCS, was commissioned Jan. 16 in Mobile, Ala. It spans 419 feet, has a displacement of 2,800 metric tons and can operate in water less than 20 feet deep. Propelled by four water jets, along with two diesel and two gas turbine engines, Independence is capable of speeds in excess of 45 knots and boasts a range of over 3,500 nautical miles. Independence will be homeported in San Diego.